After last years attempts with gardening, I am even more eager to get planting this year. Unfortunately, I think we learned that we just don't get adequate sun to really have a full veggie garden. I researched neighborhood pea patches and love the idea. The problem is the closest one is 20 minutes away. At first I was ready to take on the challenge, thinking how great it would be for the girls to garden next to others from the community and see the variety of items growing. But then I realized that each individual grower needs to do their own watering and the reality of driving there everyday won the battle. A few weeks later I was talking to a new friend I have made in the neighborhood. She was mentioning how she has always wanted to start a garden and I was commenting how I wish we had the right space for one. A few days later she emailed and asked if I would be her "Garden Buddy". I provide some man-power and my limited gardening knowledge and she would share their space. Which is the most perfect garden spot imaginable - FULL sun and backed up to their hangar for great protection. So this weekend we got to work and built 2 raised beds (well, Tom built them but we did help). Then the ladies went to the nursery for plant shopping. HEAVEN!! It has been awhile since I have had a friend who would enjoy walking through the aisles of a nursery commenting on all the amazing plants (miss you Katy!!). Yesterday, the girls and I went over and got the tomatoes, peppers, zucchini and cucumbers planted. We still need to get all of the seeds started, hopefully this week. I wasn't able to get a good photo of the little bunny who was watching us the entire time I was planting. Wondering if anything even survived until this morning or if he went and found his friends and they all came back for a feast. Side note - The computer dr. has called and supposedly my laptop is ready for pick-up. The problem seems to be a small candy wrapper got sucked up into the fan. Who in the world would be eating candy while using my prescious laptop???? I can't even imagine!!! (Really, no need to answer that as I usually have a pile of wrappers of some type lying beside me. I am guessing it was probably one of the little Hershey Kiss "flags"! OOPS!) Looking forward to having "Ruby" back this afternoon! School auction begins TODAY!!! Traditionally, most classes do an art project that will be available for bidding in the auction And would you like to know when I finally finished my contributions? Oh yeah, last night at 10:00 or so. Technically I am not even finished because the bench still needs sealing but I have 2 weeks until bidding is over, so I have time for that part still. Really, I have known about this since September and had a good plan by January/February. Why in the world do I need to push it to the last minute? Probably the same reasoning I didn't finally push the SEND button on TurboTax until noon yesterday!!! It is always a bit tricky to come up with a good project. I try really hard to do something that the students can truely contribute to and can highlight their creative side. But you also need to come up with something that a person would want to buy and keep in their home. So it is often a fine line between student art and practical items. In the end, I try and make something that I would be happy buying back and putting in my home. It may be a bit scary how many art auction projects we have in our home 8 years from now! There were some great projects done by classes this year. Quilts, blankets to donate to a shelter, fantastic framed art pieces and one of my FAVORITES: this beautiful mosaic table made by my buddy Karin. Gorgeous isn't it?? For Madison's class we made this adorable butterfly bench. Tom was kind enough to build it from the plans I found online and get it primed for me. The plans were extremely simple and I think it was hard for him not to jazz them up a bit, but I really wanted the simplicity of this style to let the student art be the main focus. The students did all the background painting with sponges. In art class we sketched and colored butterflies onto paper. I then color copied them, cut them out and decoupaged them onto the bench. This technique ensured it was truely the students' artwork, while still giving me a bit of conrol over size, location and mess-ups. Having them paint butterflies directly onto the bench seemed a bit more scary and permanent. They also painted flowers on the bench for a final touch. I think it turned out really nice and I all ready have the perfect place picked out in the yard to put it! Of course, last year someone actually outbid me on the project so we will see if there is any other interest. Fingers crossed it isn't a total flop!! I am also the art docent for the afternoon kindergarten class since there wasn't a class parent who could do it. So I did an auction project for that class too. I will readily admit I wasn't as willing to put in the time, effort or money into a project for a class that my chid isn't in. But I still think we came up with an fun project that highlights each students' individual art work. And it was a nice easy project. Our auction is a bit different than many schools that do a live auction event. Ours is all done E-Bay style on-line. So bidding lasts for 2 weeks and allows a greater number of families to participate. Fingers are crossed for a great 2 weeks of bidding for a fabulous cause. The PTA does a ton to help fund programs at the school along with other purchases, volunteer support/organiztion and more. And with MORE budget cuts by the district our contributions are even more important than ever. Of course, I have a bit more vested interest since I was just voted PTA president. EGADS what was I thinking??? But I will save that freak out for another post!! If you are reading this and at all interested in bidding on our auction to help support our school, let me know and I can give you the link. There are tons of gift cards to restaraunts (Red Robin, Panda Express, Mexican.....) along with lots more great items. Often times you can find something that you would be spending the money on anyways and you can support our school while you do it! BONUS!!! Now I must go and start bidding away on the items I want!! My laptop has been waging a slow war on my patience and I think it has finally won. It is time to surrender and admit defeat and take it to the computer dr for repair. Unfortunately, my taxes are still on it nicely waiting to be sent out. I still have plenty of time, right:-) Nothing like waiting until the last minute!! Hoping my pretty, red, addictive device will play nice for me to at least get them off and onto the old, ugly, grey dinosaur that does not make me nearly as happy. Amazingly, it was exactly this time last year when I got the "blue screen of death" on my laptop (I am thinking she needs a name, Ruby???) and was without it for a month. The deal is, it only took a few days to fix, I just drug my heals about dealing with it and am doing the same this time. Must move it to the top of my to-do list or else the withdrawal symptoms may kick in severly. Which we would all hate to see, right? Hoping to be back in blogging, facebook and email bliss soon!! 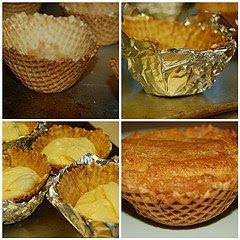 "Take each waffle cup and line with tinfoil. To be honest, I somewhat question if this step is necessary. I tried one without the tinfoil and it turned out fine. The tinfoil process if frustrating for the kids and often results in broken cups. So if you want to follow the exact directions, cover with tinfoil. If you are a rebel, then skip it!!" So for the sake of saving time and energy, I decided to be a rebel and skipped the tinfoil step. I am thinking that was a big mistake. Now I have 4 second graders and 2 5 year olds coming over in 1.5 hours planning on a cupcake decorating party. I need to quickly scramble for plan B (along with getting my house cleaned). Wish me luck!